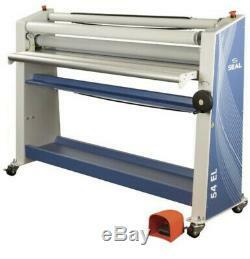 The SEAL 54 EL-1 is a cold roll laminator capable of mounting and laminating pressure-sensitive graphics up to 54 wide. Designed for ease-of-use and minimal maintenance, the 54 EL is ideal for new users wanting to create professionally-finished wide format graphics. 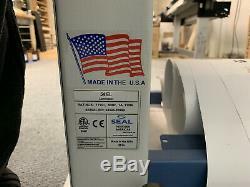 Cold roll laminator confidently finishes a variety of applications. Laminates graphics up to 54 wide. 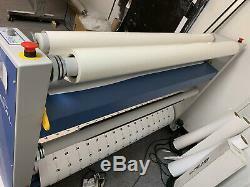 Capable of laminating at speeds up to 14 feet/minute. Durable uniframe construction requires no assembly and minimal maintenance. Flip up feed table for easy webbing. Safety eyes for increased operator safety. Foot switch for hands free operation. Optional image guide ensures perfect alignment and flat lamination. 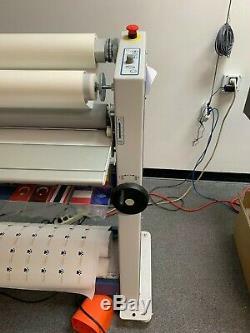 Optional roll trough keeps rolled prints in place before and during lamination. 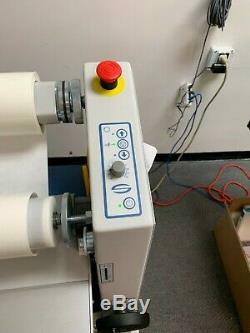 Optional leveling feet keeps the laminator stable for the highest quality finished product. Electrical Requirements: 115 VAC, 50-60 Hz, 1A, 115W - NEMA 5-15 plug. Maximum Speed: 14 ft/min (4.25 m/min). Maximum Working Width: 54 (1372 mm). Weight: 325 lbs (147 kg). Dimensions: 71.3" x 48" x 24 (1811 x 1220 x 610mm). 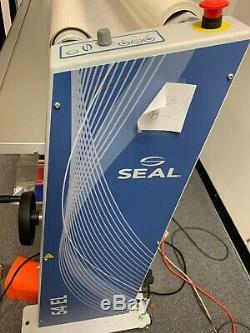 The item "Seal 54 EL Cold Roll Laminator Professional Easy to Use MADE IN USA" is in sale since Saturday, March 2, 2019. 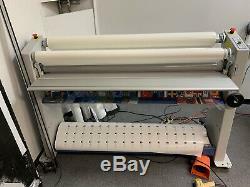 This item is in the category "Business & Industrial\Office\Office Equipment\Laminating Equipment\Laminating Machines". The seller is "gottagift83" and is located in Minneapolis, Minnesota. This item can't be shipped, the buyer must pick up the item.